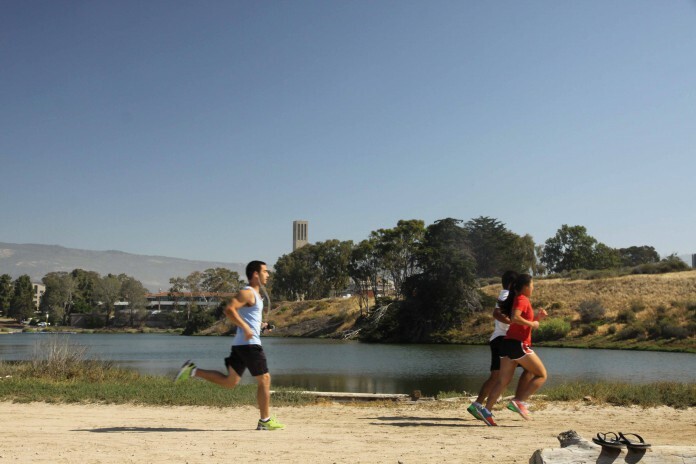 Students from the University of California, Santa Barbara participated in a 5K race held by Camp Kesem around the lagoon on May 2. Camp Kesem is a nationwide organization that dedicates its resources to holding events for children of cancer patients. The UCSB Chapter is in its first year on campus. Registration for the race began at 9 AM and the race started at 9:45 AM. After the race, participants were offered free Camp Kesem T-shirts and food. Third-year biopsychology major and first place winner (with a time of 17.10.35) Adam Roeder said why participating in events like this are important. After the race, first-year electrical engineering major Himangshu Chowdhury said he feels events like the 5K are a positive thing to participate in. Participants were encouraged to leave a painted hand print and signature on a large sign that read “CK 5K 2015—I Had A Hand in the Magic of CK.” Camp Kesem coordinators plan on taking the sign to their summer camp, scheduled for June after graduation. According to Hiekali, the race was made possible thanks to the support and donation of the community. At the end of the event, Hiekali stated why events like this are mutually beneficial for the community and for Camp Kesem. If you want to get involved in Camp Kesem, Hiekali recommends following the organization’s Facebook page titled: Camp Kesem UCSB. General meeting information is posted periodically on the page.